New construction homes continue to go the way of the dodo bird. There are currently 3,149 new construction units listed for sale in the MLS system, down 25.0 percent and over 1,000 units from a year ago. Unfortunately, sales are down even farther, which has pushed the Months Supply of Inventory for new construction properties up to 11.3 months. You may have heard the news that home sales are increasing in the Twin Cities. The rise is entirely in the single-family detached segment, however, as both townhomes and condominiums are selling less frequently this year than they did a year ago. Similarly, the recent uptick in sales has missed the upper bracket market. Home sales above $190,000 are down 20.0 percent in the last year. Click here for the full April Housing Supply Outlook. Builder confidence in the market for newly built single-family homes plunged in November as worsening problems in the financial markets, job market weakness and overwhelming uncertainty about the economy continued to negatively impact consumer behavior, according to the National Association of Home Builders/Wells Fargo Housing Market Index (HMI), released today. The HMI sank five points to 9, the lowest level recorded since the series was created in January of 1985. Lowest in history, just like general consumer confidence. Builders are between a rock and a hard place. Put new projects in the ground and they're more likely to lose money than make it. Do nothing and you've got zero cash flow, which ain't good if you want to keep the lights on at the office. Locally, builders should be applauded for pulling back on creating new housing supply, as the market doesn't really need more homes for sale at this juncture. The number of new construction properties for sale in the Twin Cities MLS was at 3,546 at the start of November—down a healthy 27.4 percent from last November according to our Housing Supply Outlook report. And there's certainly not a deluge of new builder supply coming up on the horizon, the Builder Association of the Twin Cities has been telling us. According to their numbers, 2008 new construction permit activity is down 69.4 percent from the peak year of 2004. Year to date, only 4,754 unit permits have been issued in the region. In 2004, there were 15,561 issued by this point in the year. We can thank them for their efforts in reducing our housing supply, but something tells me a thank you is cold comfort at this point. Builders are in the business of building. Here's to hoping they can weather the downturn for as long as lasts and come back strong when demand perks up once again. The new construction market has achieved an important step towards its eventual recovery. The Months Supply of Inventory for new construction properties is now less than at this time one year ago -- dropping slightly from 11.0 months in July 2007 to 10.8 today. This figure has been increasing steadily for several straight years. A drastic decrease in new construction inventory is the reason for the decline. Condominium prices continue to indicate healthier dynamics than the other property types, with both average sales price and price per square foot up slightly. This sub-market seems to have peaked and flattened earlier than others, and also has far fewer foreclosures and short sales affecting overall price data. The entire market continues to shift downward to the lower price ranges, in both supply and demand -- an indication of the growing prevalence of lender-mediated foreclosures and short sales in the Twin Cities. Click here for the full Housing Supply Outlook. Once again, we pick up here where we left off with the fourth part of our new series: Lessons from the RREAR, where we dig deeper into the data found in our Annual Residential Real Estate Activity Report. 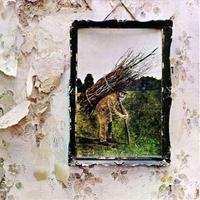 This is the fourth post in the series, so it's kind of like Led Zeppelin IV, only with fewer 9-minute meandering acoustic tracks about hobbits and more analysis of housing market activity. Other than that, they're completely identical. Today's subject: New Construction Sales. 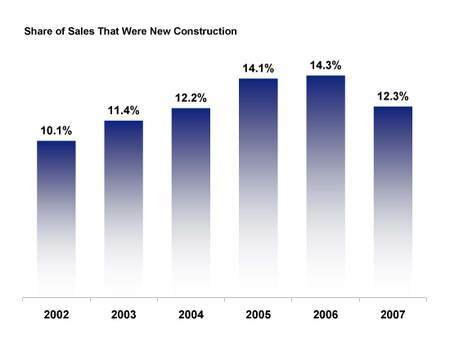 The new construction market reached its fevered peak in 2006. It was a wet n' wild ride for several years, with every day bringing news of a new housing development springing up from the cores of the two downtowns to the fringe exurbs to the first-ring infills. But now builders have wisely stepped back. New construction inventory in the MLS has declined by around 25% in the last year, and 2008 should prove to be one of the lowest years on record for new building permits. All this adds up to a rebound in market share for previously owned homes. While the region's population is still growing, the demand for new owner-occupied housing units appears to have been satiated for now, and builders are refocusing on selling their existing inventories. For a look at the geographic boundaries of these MLS areas, visit here. And stay tuned in the weeks ahead for more Lessons from the RREAR.